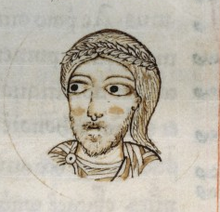 Louis as shawn in a 12t-century manuscript o Johannes Berardi's Chronicon casauriense. Louis II, sometimes cried the Younger (1 November 825 – 12 August 875), wis the Keeng o Italy an Roman Emperor frae 844, co-rulin wi his faither Lothair I till 855, efter which he ruled alone. ↑ His ordinal an nickname comes frae the fact that he wis the seicont Louis tae be emperor efter his grandfaither Louis the Pious. This page wis last eeditit on 25 Mairch 2017, at 19:17.